Smile for the camera – it’s Christmas! 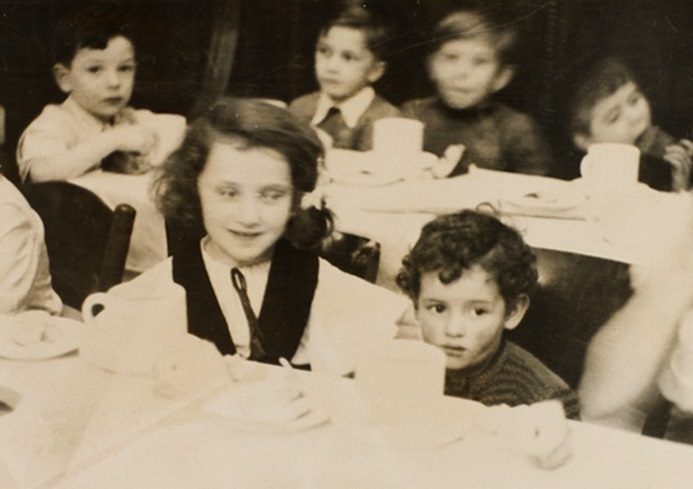 The children in the photograph are Lord Mountbatten’s cousins – his mother, Princess Victoria, and Princess Irene, were sisters – daughters of Grand Duke Louis IV of Hesse and the Rhine and his wife Princess Alice, a daughter of Queen Victoria. 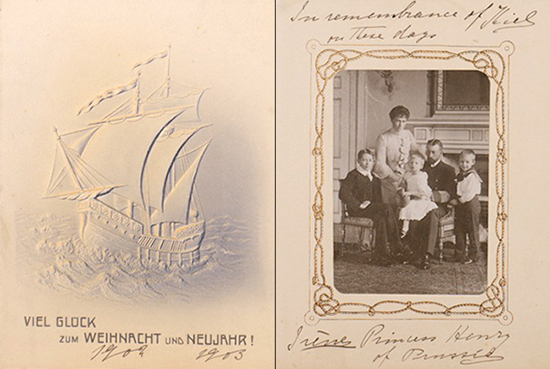 Irene has signed the card herself and written “In remembrance of Kiel on these days” – recalling memories of happy holidays in Germany. 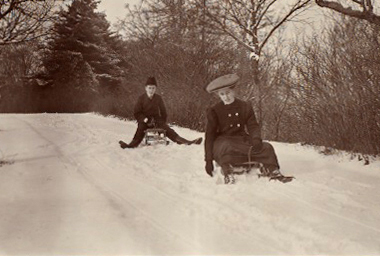 Here is a photo of Mountbatten’s sister, Princess Louise of Battenberg (nearest the camera) tobogganing with her brother, Prince George, probably in the grounds of Heiligenberg Castle, c.1908-9. The nineteenth-century castle, in Hesse, Germany, was the home of their grandparents and a favourite holiday destination. 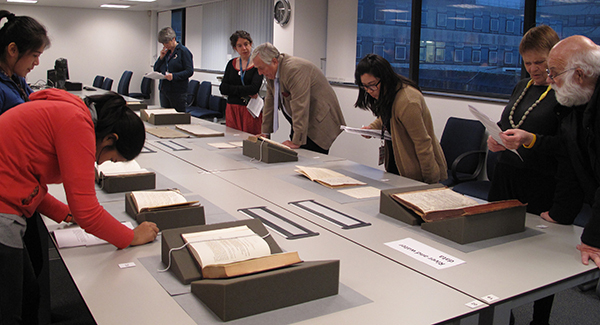 This week we wish you all ‘happy holidays’ – a very merry Christmas and a happy New Year! As Christmas approaches and Chanucah has arrived, thoughts are probably turning to gifts, the custom of giving presents being associated with both festivals. The first Duke of Wellington was very much a celebrity of his day and as such he found himself the recipient of numerous gifts at all times of year. These ranged widely: porcelain and china from the King of Prussia and the King of Saxony respectively; food such as a boar’s head sent all the way from Saxony and French produce including a flan, a turkey, two pairs of wild ducks, a brace of partridges and a brace of woodcocks; the skins of animals killed in Africa, including a lion that had attacked and partly devoured eight people; to a husky and samples of two-year-old biscuit and preserved meat carried on a ship that had sailed to the North Pole. Wellington became so inundated by gifts of published works that he took the decision to order his servants not to receive packages without his orders. 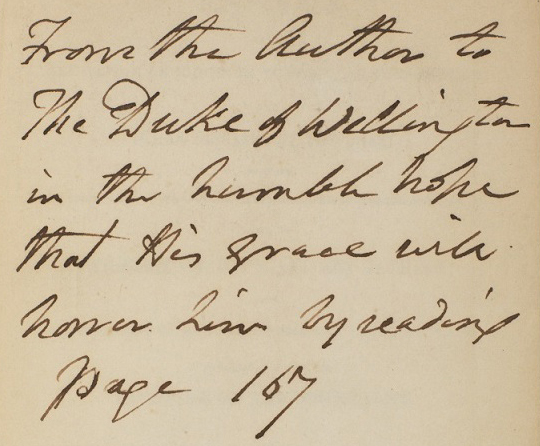 While this might be an inconvenience to those seeking to send gifts to Apsley House, as the Duke noted in a reply to Thomas Anstey: “I assure him that any inconvenience he may have suffered does not equal one tenth of that which I suffer daily from this description of intrusion.” [Wellington Papers 1/798/2] This did not stop the flow of publications sent to Wellington and the Wellington Pamphlet collection at Southampton is made up of a wide range of pamphlets sent to the Duke throughout his lifetime. We wish you great joy both in the giving and the receiving of gifts, whatever these might be.